Normal IOP may be defined as that pressure which does not lead to glaucomatous optic nerve head damage. IOP is determined by a balance between production and drainage of aqueous humor in the eye. Normally, the IOP ranges from 10-21 mmHg. 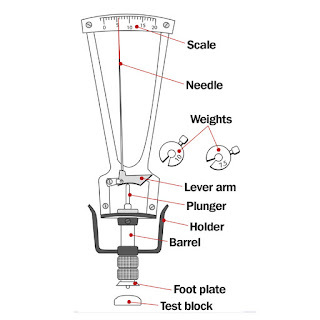 Tonometers are used to measure IOP. They are of different types depending on the shape of deformation they produce. In indentation tonometry the shape of deformation is in the form of a truncated cone. However, the precise shape is variable and unpredictable. The tonometer also displaces a relatively large intraocular volume. As a result of these peculiar characteristics, conversion tables have been developed to calculate IOP. These tonometers are also affected by scleral rigidity. Thin scleras giving abnormally low and thick/rigid scleras giving abnormally high IOP values. An example is the Schiotz tonometer. In applanation tonometers the shape of deformation is simple flattening. Since the shape is constant, its relationship to IOP can be derived from mathematical calculations. Applanation tonometers are of 2 types: (1) Variable force: It measures the force required to applanate (flatten) a standard area of the corneal surface e.g. Goldmann Tonometer (GT). (2) Variable area: It measures the area of the cornea, which is flattened by a known force (weight), e.g. Maklakov Tonometer. The GT is regarded as a gold standard in IOP evaluation. Goldmann based his tonometer on the Imbert-Fick law, a modification of the Maklakov-Fick law. According to this law, the external force (W) against a sphere equals the pressure in the sphere (Pt) times the area flattened (applanated) by the external force (A). However, the Imbert-Fick Law has been modified to account for the surface tension, the force to bend the cornea and inner area of flattening. The cornea is anesthetized and fluorescein is instilled. The tonometer head is slowly made to touch the central cornea until the mires (semicircles) are visible. Subsequently, the counter attached to the tonometer is turned till the inner parts of the mires are in contact with each other. 1. 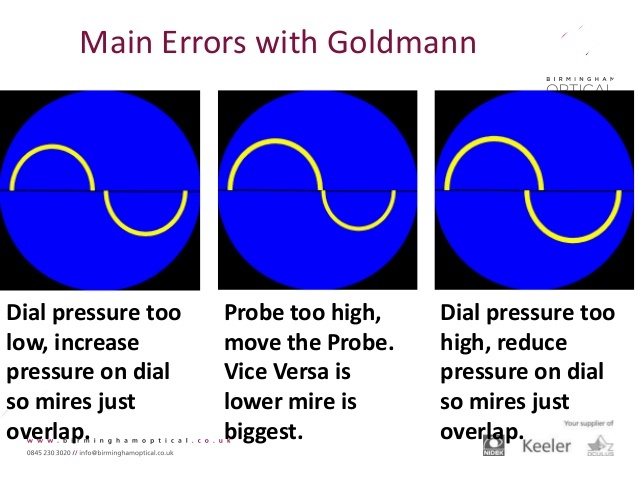 Semicircles: Wider menisci cause falsely higher pressure estimates. Improper vertical alignment will also lead to a falsely high IOP estimate. a. Thickness: GAT works best at a central corneal thickness (CCT) of 525 µm. Thinner corneas are associated with falsely low IOPs and thicker with falsely high IOP. b. Curvature: Increased curvature associated with falsely high IOPs. An increase of 1 mmHg is seen with every 3Ds increase in corneal power. c. Astigmatism: IOP is underestimated for with-the-rule and overestimated for against-the-rule astigmatism. There is 1 mmHg of error for every 4D of astigmatism. To minimize this error rotate the biprism until the dividing line between the prisms is 450 to the major axis of the ellipse or an average of horizontal and vertical readings taken. An irregular cornea also distorts the mires. 3. Prolonged contact: Leads to corneal injury as well as a false lowering of IOP. 4. 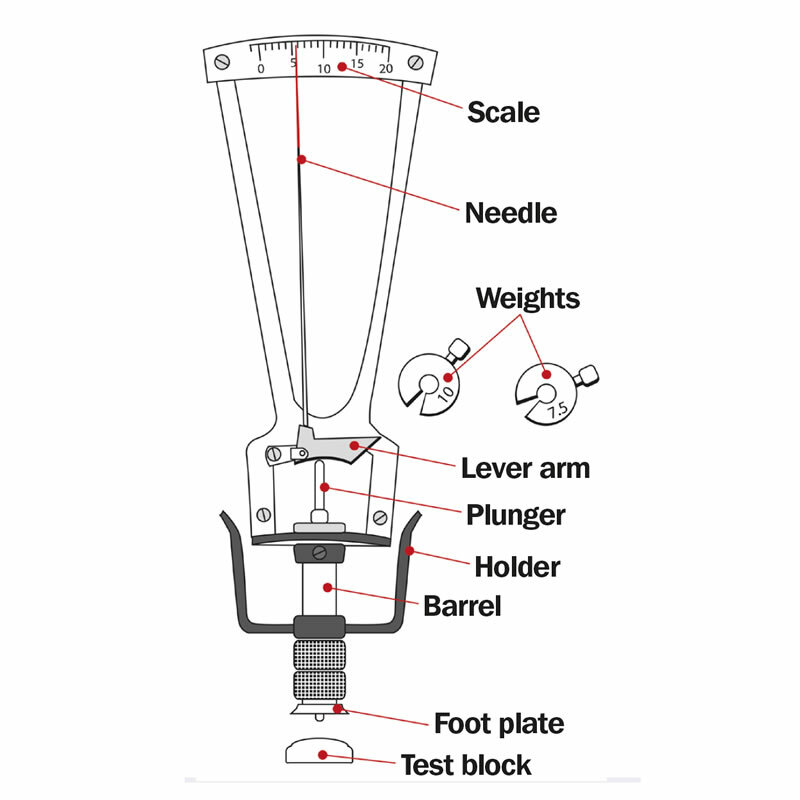 Calibration: Monthly calibrations of the instrument are important to avoid errors. Disinfection: It is done by soaking the applanation tip for 5-15 minutes in diluted sodium hypochlorite (1:10 household bleach), 3% hydrogen peroxide or 70% isopropyl alcohol. The tip can also be wiped with alcohol, hydrogen peroxide, povidone-iodine, 1:1000 merthiolate or dry tissues. Ten minutes of continuous rinsing in running tap water removes HBV surface antigen. An example of the rebound tonometer is the iCare device (Helsinki, Finland). The iCare Pro can assess IOP with the patient lying down. A 1.8 mm diameter plastic ball on a stainless steel wire is held in place by an electromagnetic field in a handheld battery-powered device. When a button is pushed, a spring drives the wire and ball forward rapidly. When the ball hits the cornea, the ball and wire decelerate; the deceleration is more rapid if the IOP is high and slower if the IOP is low. The speed of deceleration is measured and is converted by the device into IOP. No anesthetic is necessary for this device. 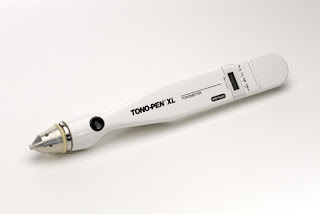 It shows good agreement with Goldmann and Tono-pen readings. 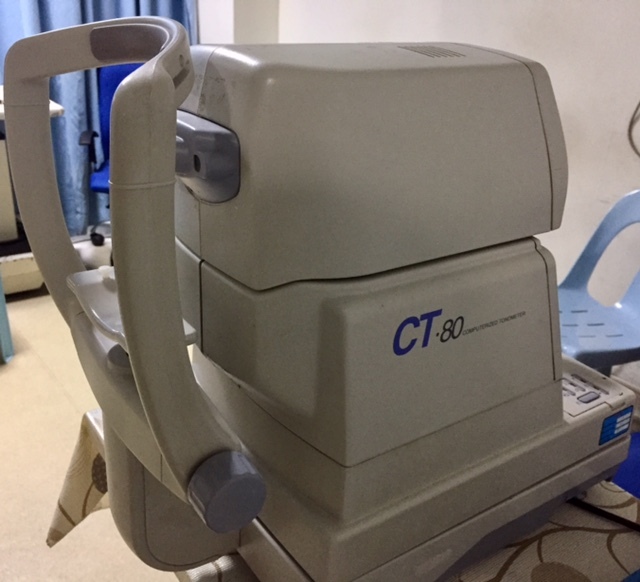 However, IOP measurements obtained with this tonometer are influenced by CCT, with higher IOP readings with thicker corneas. This tonometer is also affected by other biomechanical properties of the cornea, including corneal hysteresis (CH) and corneal resistance factor (CRF). The disposable tips also increase the cost of the instrument. An advantage is the small size, so it can be used in children and those patients who have corneal abnormalities, including after corneal -grafts or –implants (Corneal inlays or rings). Dynamic contour tonometer (DCT) or Pascal tonometer (SMT Swiss Microtechnology AG, Port, Switzerland) has a 7-mm diameter concave-surface probe which adapts to the cornea’s contour and without altering its shape or curvature. An electronic pressure sensor embedded in the tonometer’s concave probe surface enables direct measurement of transcorneal pressure. Nearly 100 IOP readings are taken per second. In contrast to the Goldmann tonometer, measurements with the DCT are reported to be influenced less by corneal thickness, and perhaps corneal curvature and rigidity. Some measurement differences have been noted with the Goldmann Tonometer (mean overestimation 2.3 mmHg). Therefore, the two tonometers may not be interchangeably used. However, the DCT can provide valuable information in persons whose corneal thickness is far from the mean or in patients who have undergone refractive surgery. 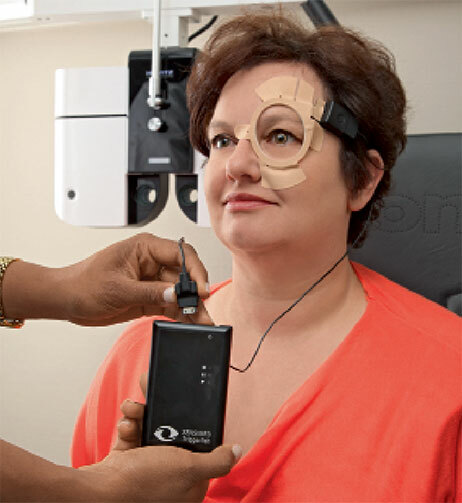 DCT can also be used to measure the ocular pulse amplitude. The ocular pulse amplitude is defined as the difference between diastolic and systolic intraocular pressure. The ocular pulse is generated by the pulsatile ocular blood flow in the choroid. This forms a part of the concept of vascular theory of glaucoma. The instrument has to be used in conjunction with a slit-lamp, has disposable tips which increase cost, requires prolonged tip contact and specialized training to use it. ORA and CORVIS tonometers not only measure the IOP, but also provide information on the biomechanical properties of the cornea and thus have the potential to correct IOP readings for these factors. Corneal biomechanical variables and the dynamic corneal behaviour can also be assessed independently. Studies have shown that low corneal hysteresis is more likely a risk factor for glaucoma, rather than CCT. 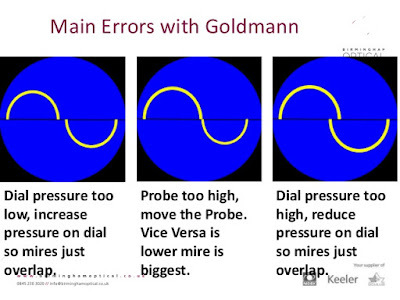 Goldmann Tonometry is influenced by CCT, which affects reliability of the instrument. Ocular Response Analyzer [ORA] (Reichert Inc., Depew, New York, USA) is an airpulse tonometer. It utilizes a dynamic bi-directional applanation process to measure biomechanical properties of the cornea and IOP. 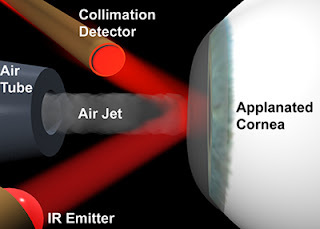 A precisely collimated air-pulse causes the cornea to move inwards, past applanation, and into a slight concavity. 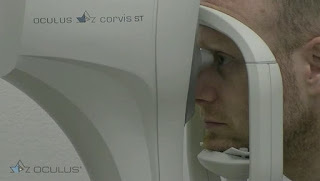 Milliseconds after applanation, as the air pulse force decreases, the cornea begins to return to its normal configuration. In the process, it once again passes through an applanated state. An electro-optical system monitors the curature of the cornea throughout the deformation process, taking 400 data samples during the 20-millisecond measurement. 2 independent pressure values are derived from the inward and outward applanation events. A difference between the 2 gives the corneal hysteresis. Thus, the ORA introduces two new concepts relating to the deformability of the cornea: corneal hysteresis (CH) and corneal response factor (CRF). These reflect the viscoelastic properties of the cornea. CH reflects the capacity of the cornea to absorb and dissipate energy and forms the basis for the instrument’s correction of IOP. The result of this correction is known as “corneal compensated IOP” (IOPcc). This new pressure is apparently less affected by corneal properties than that provided by a conventional applanation tonometer. The CRF indicates the overall resistance exerted by the cornea and is related to central corneal thickness and IOP. Whilst there is promising published evidence, the role of CH and CRF in the diagnosis and management of patients with glaucoma is yet to be fully established. The disadvantages are: The machine is fixed to a table and requires frequent maintenance. However, it does provide reliable IOP measurements. The Corneal Visualization Scheimpflug Technology Tonometer [Corvis ST] (Oculus, Wetzlar, Germany) allows quantitative and visual assessment of the biochemical properties of the cornea. The instrument incorporates an air pulse tonometer and in-built pachymeter. 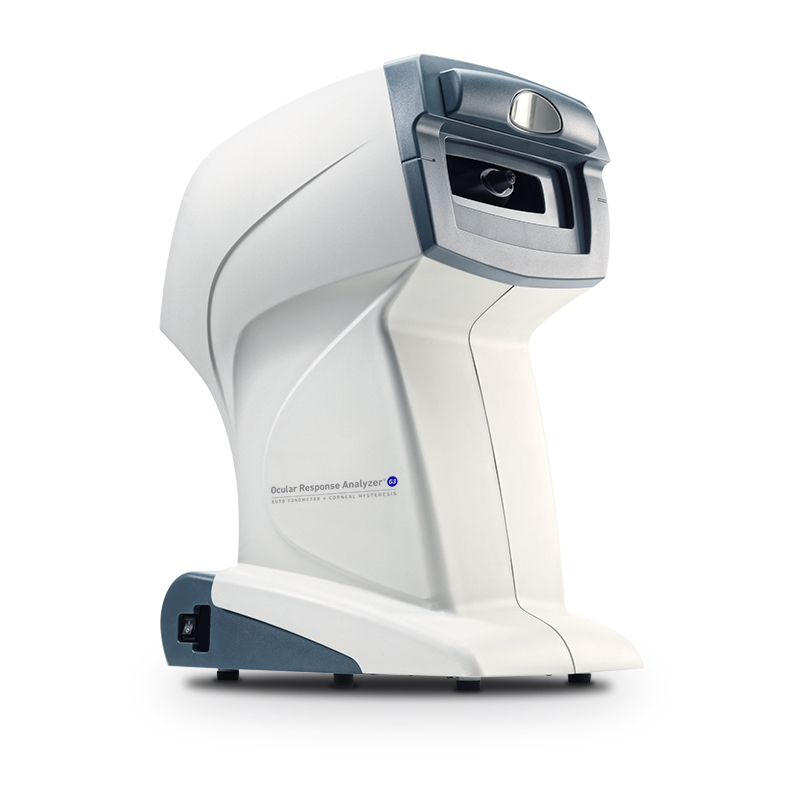 The instrument incorporates an ultra high-speed Scheimpflug camera and records the anterior chamber at the moment of corneal deformation in real time. It measures variables related to corneal deformability such as the time, velocity and length of the first and second applanations, maximal concavity, and the deformation amplitude. These biomechanical variables have to be assessed further to understand their role in the development and progression of glaucoma. The tonopen XL is based on the Mackay-Marg indentation tonometer. It is a handheld instrument with a strain gauge that creates an electrical signal as the footplate flattens the cornea(microstrain gauge technology). It is portable, simple to use, can be used in both sitting and lying positions and also offers easy calibration and use, by providing a digital readout. The final IOP is calculated on the basis of 4 readings, providing the coefficient of variation, which must be less than 5% for accurate measurements. It has disposable latex covers; it can be used through contact lenses and can be used over irregular corneas due to the smaller diameter of the contact area (2.36 mm2 for tonopen, versus 7.35 mm2 for the GAT). While some studies found it to correspond to GAT measurements, others found it to unreliable over IOPs above 20mmHg. In this instrument a puff of room air is used to create a constant force which deforms the central cornea. A collimated light beam emerges from the machine and is detected by an optoelectronic system. The moment the central cornea is flattened, the greatest numbers of light rays are received by the detector, giving rise to the peak intensity of light. The point from an internal reference point to the point of maximum light detection is then converted into IOP. The time interval for an average NCT to measure is 1-3 milliseconds (1/500th of a cardiac cycle). It is random to the phase of cardiac cycle. Thus the ocular pulse becomes a significant factor in the detection of IOP. In order to obviate that, 3 readings can be taken and an average calculated. The SENSIMED Triggerfish® (CLS, Sensimed AG, Lausanne, Switzerland) consists of a silicone contact lens with an embedded pressure sensor that enables continuous IOP monitoring. The sensor takes pressure measurements over 30 seconds every 5 minutes to provide 288 measurements after 24 h of lens wear. The soft disposable contact lens embedded with a miniaturised telemetric sensor detects the circumferential changes in the area of the corneo-scleral junction. 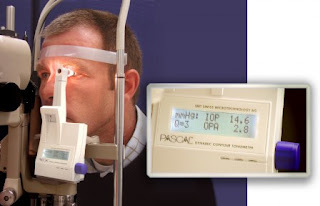 The IOP is calculated from the changes in ocular volume detected by the instrument. A flexible adhesive antenna worn around the eye wirelessly receives from the contact lens the continuous acquired information and transmits it to a portable recorder via a thin, flexible cable. 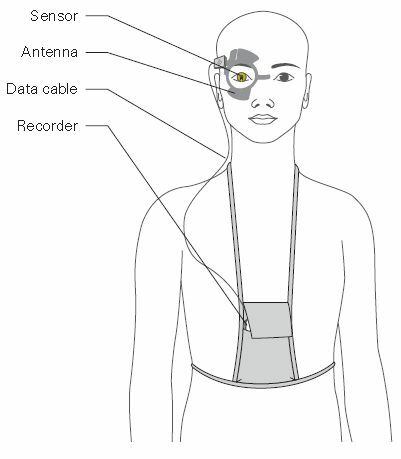 The portable recorder, worn by the patient, stores the acquired data during the monitoring session. At the end of the recording period, the data is transferred via Bluetooth from the recorder to the software previously installed on the practitioner’s computer. The software enables specialists to manage and visualise the patient’s continuous IOP profile. The data provided by the SENSIMED Triggerfish® complements punctual tonometer measurements and offers a qualitative profiling of the patient’s IOP for up to 24 hours. 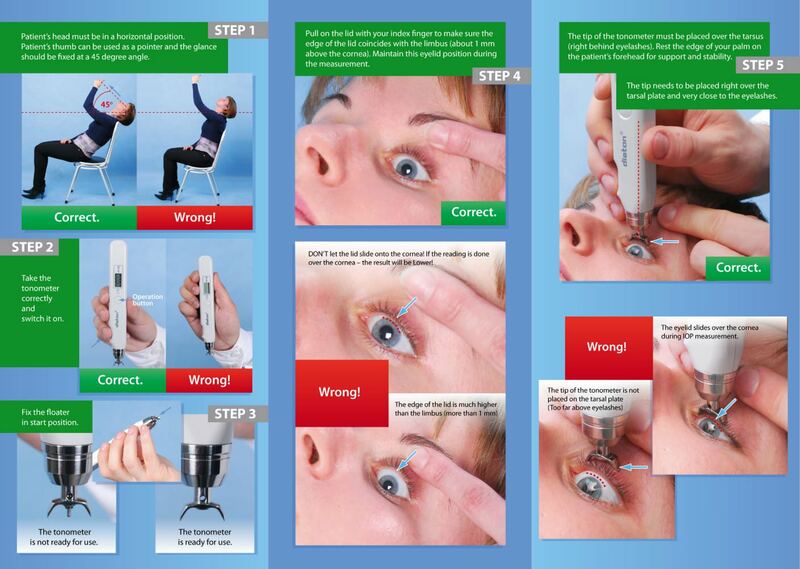 The Diaton tonometer is a hand held device that measures IOP through the eyelid. It is useful to assess IOP in the presence of ocular infections (keratitis), in patients after corneal surgeries, with contact lenses on, in immobilized patients, to monitor IOP by family members at home. Comparison with Goldmann applanation Tonometry was found to give good results.